Martha Stewart was on television long before she had a magazine. In fact, the beginnings of Martha Stewart Living Television can be traced back to the late 1980s and Martha Stewart's merchandising deal with Kmart. In 1987, Martha Stewart became the spokesperson for a line of kitchen and bath products, the Martha Stewart Everyday brand, sold exclusively at Kmart stores. With a series of best-selling lifestyle books about cooking, gardening, weddings and entertaining, she had already become one of the country's most trusted homemaking advisors. Martha was now being featured in the ads of one of the country's most popular stores, both in print and on television. The television advertisements featured Martha using the Kmart products and offering household tips: using tea towels as placemats and napkins, demonstrating how to fold a fitted sheet and whipping up a recipe in one of her signature pieces of cookware. These early ads were the seeds of Martha Stewart Living, the nationally syndicated program that would eventually earn her a series of Emmy Awards for exceptional service show. Around this time, Martha also sold a series of how-to videos through Kmart. The videos were independent projects filmed at her home on Turkey Hill Road in Connecticut. One series of videos called 'Martha Stewart's Secrets for Entertaining' featured Martha hosting a buffet party, a formal dinner party, an antipasto party and a holiday party. Another series was devoted to renovating a home in Connecticut - the old Adams House, a Federal style home in Westport, which Martha and a team of renovators restored and modernized and later auctioned for charity. Martha very quickly realized that the wide reach and appeal of television could be instrumental in advertising and building awareness about her burgeoning brand. Not long after the production of the videos, Martha saw her first holiday special air on television. It included classic Martha segments, such as stuffing a holiday turkey and then wrapping the entire bird in puffed pastry. She gathered brussels srpouts from her garden, cooked game hens in her smoke hut and set a festive table. Shortly after the successful launch of her magazine, Martha Stewart Living, in 1990, Martha took her TV idea to the next level. It was a Group W executive named Richard Sheingold who met with Martha about the idea for a television show, and he was initially very skeptical about the idea of a home and garden show that revolved around the lifestyle of its host, something that had never been done before. When he said that getting a show off the ground meant losing money, Martha said she didn’t care about that, reiterating that she was confident it would fly and that she had good contacts in the advertising business thanks to her magazine and her relationship with Kmart. It was only a few days after first meeting with Martha that he understood her brilliant plan. Martha would be cross-promoting the magazine on the air that would be carrying the ads of the companies that would also be advertising the show. It was a synergy model that incorporated numerous media to promote a single brand. There had never been anything like it before. By 1995, 97 percent of the American population could tune into Martha Stewart Living, with 182 stations carrying the show in 185 markets. What had begun as a half-hour weekly television show quickly became an hour-long, syndicated daily show on CBS as its popularity continued to increase. In 1996, her show garnered the coveted 9 a.m. timeslot and was the most popular women's television program in the country. It was being aired in Canada and other countries as well. Martha was now an internationally recognized star. Group W had also made a fortune and her magazine was one of the top-selling publications in the country, with over two million subscriptions. The show was noticed by critics, too. During its eleven years on air, the show won nine Daytime Emmy Awards and was nominated for 22 others. 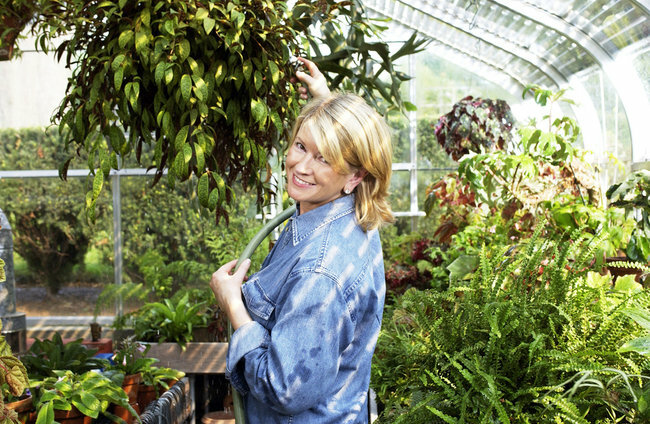 Originally filmed at her home in Connecticut, her charming Turkey Hill estate, the production of Martha Stewart Living was eventually moved to a studio in 1995. Complaints from neighbours about the never-ending stream of television crews on the quiet suburban street and the constraints of the property prompted Martha to expand to a studio space, but segments filmed at her home, particularly her astounding garden, were always components of the program. Westport Digital Studios, Inc., was leased by Martha Stewart Living Omnimedia and included three sound stages, a broadcast-ready control room, two shoot-ready prep kitchens with stainless work surfaces, radio broadcast facilities where her Ask Martha segments were taped, editing suites, offices, a guest cottage for overnight housing, an onsite gym featuring an entertainment system, six acres of wooded grounds, aesthetically maintained for outdoor filming, and multiple barbecue grills. The kitchens and the 'home' studios (living rooms, dining rooms, craft rooms) were all designed by Martha to replicate rooms in her own homes. 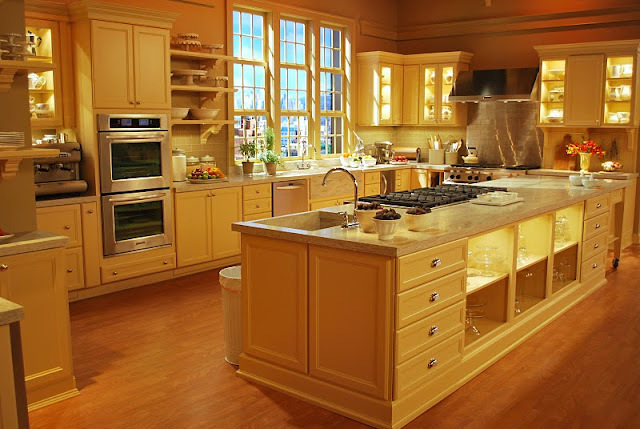 There was a kitchen that looked similar to her private kitchen at Turkey Hill in Westport and another one, done in darker tones, resembled her Lily Pond Lane kitchen in the Hamptons. The effect of the show was instructional and serious, but always with an air of calm. Viewers enjoyed not only "learning something new everyday," as the show promised, but also enjoyed watching Martha do things so perfectly, from baking to sewing to gardening. The slow, luxurious pace of the program was a welcome change from the up-tempo drive of many other daytime shows in its slot, and it was by far the most informative. Guests of the show included Bill Cosby, Rosie Donnell, First Lady Hillary Clinton, Oprah Winfrey, Cindy Lauper, Sarah McLachlan and numerous chefs from around the world. Restauranteurs, entrepreneurs, collectors, painters, potters, sculptors and professional gardeners all imparted a special brand of knowledge to the viewers under Martha's careful guidance. Segments of the show were repurposed into two other weekend shows that aired on the Home and Garden Channel and on the Food Network, further broadening the reach of the brand by expanding the audience. From Martha's Home and From Martha's Kitchen were half-hour shows that were structured by theme with previously-aired segments from the show. 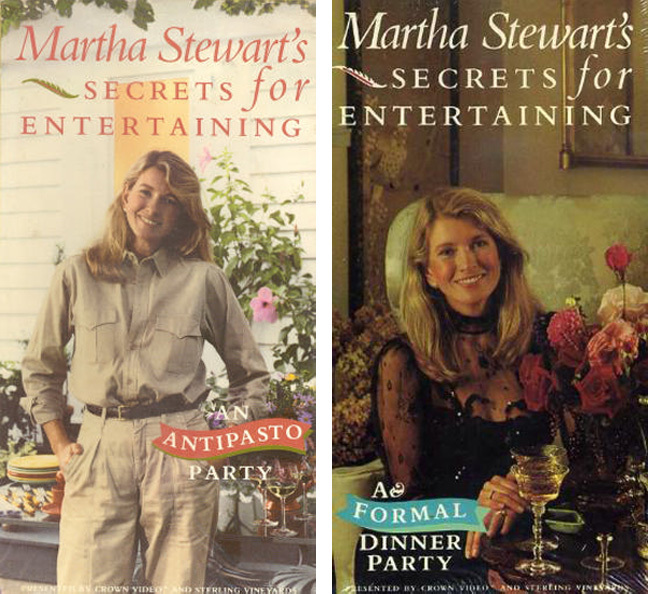 Several VHS tapes were also released featuring the best segments of Martha Stewart Living: a holiday tape, a springtime entertaining tape, etc. These tapes are considered fairly rare today since they did not enjoy wide distribution. In 2003, the show began to significantly decline in popularity as Martha faced criminal charges of obstruction and conspiracy related to a questionable stock sale. The company embarked on a diversification strategy and began to develop new programming, including a how-to cooking show based around their new hit magazine Everyday Food, which launched in January of that year. The show did not feature Martha as the host. Instead, it included a cast of chefs from the kitchens of Martha Stewart Living, including Sarah Carey, Lucinda Scala Quinn, Margot Olshan, Emma Feigenbaum, Allie Lewis and John Baricelli. Aired on PBS, the show featured straightforward cooking demonstrations that were simple and easy to follow. MSLO also began developing a show called Petkeeping, with host Marc Morrone, also slated for air on PBS. The aim was to widen the reach of the television department without relying too heavily on the face and image of its founder, who was now in serious trouble with the law. Martha Stewart Living continued to tape new shows but it was eventually cancelled by CBS in 2004 after Martha was sentenced to five months in prison and another five months of house arrest. Repeats of the show aired on some channels, but many stations pulled the program completely. After her stint in prison, Martha was eager to get back to work and she wasted little time in redeveloping the television division. A new partnership between Omnimedia and Mark Burnett Productions, the producer responsible for the smash-hit "Survivor" reality TV show, led to two new television programs, both of them starring Martha. The first was a live talkshow featuring Martha doing all the things she did in the old program (cooking, gardening, crafting and decorating) but in a large new studio in the Chelsea district of Manhattan in front of a live audience. The Martha Stewart Show had celebrity guests and performances as well as cooking segments with experts in a space modeled after her new home in Bedford, New York. The show debuted in September, 2005, and was designed to reveal the more human side of Martha: someone who could make the occasional mistake and laugh about it. It was designed, in part, to resurrect and repair her image after such a long period of bad press, to make her seem likable, approachable and less of a perfectionist. The second show, which also aired in the fall of 2005, was a version of The Apprentice, a reality series that starred Donald Trump testing potential candidates through a series of challenges that would eventually lead to a choice position at his company. In this new version, Martha Stewart would undertake the same scenario and would eventually hire one of the candidates to run a division of her company. The show also starred her daughter, Alexis, and Charles Koppelman, the chairman of her company. They acted as her judges and advisors. The Apprentice: Martha Stewart bombed in the ratings. At one point, it looked as if the series wouldn't even make it to completion, the ratings were so low. The studio threatened to pull the plug. It aired during the same season as Donald Trump's Apprentice program and both programs suffered from overexposure. The Martha Stewart Show faired much better. It was renewed annually for seven years and has won an Emmy Award with several other nominations. The show was eventually sold to the Hallmark Channel, which also developed a series of new programs, including Martha Bakes and Mad Hungry, with host Lucinda Scala Quinn, while also airing past episodes of Martha Stewart Living and Everyday Food. After only two years, however, Hallmark severed its ties with Martha and The Martha Stewart Show ceased production. The Chelsea studio was vacated and Martha moved all of its props back to the Starrett Lehigh building where Omnimedia is headquartered. In 2012, Martha signed on with PBS to develop a new program called Martha Stewart's Cooking School - a half-hour how-to program based on Martha's cookbook of the same name. The show featured Martha as the host, demonstrating basic cooking methods, such as braising, stewing, steaming and roasting, as well as tips and techniques to help the new (and more advanced) home cook sharpen her skills. Martha's old programs were not laid to waste, however. 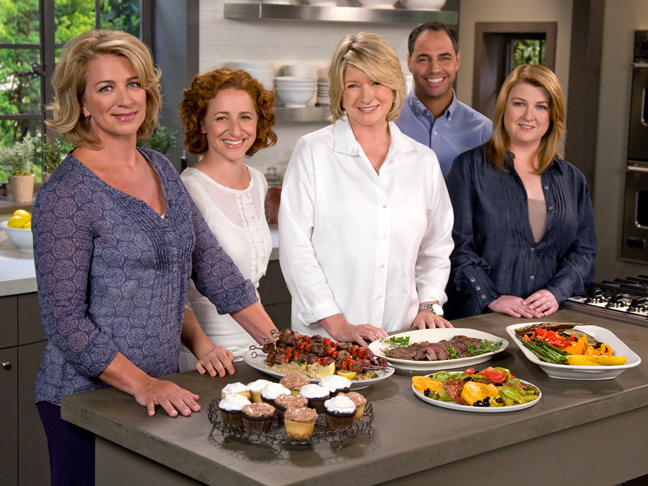 A partnership with Warner and Omnimedia saw the release of 13 DVDs, which compiled past episodes of Martha Stewart Living in thematic segments: Halloween, The Holiday Collection, Baking Favorites, Favorite Cookies, Spring Gardening, Favorite Family Dinners, The Weddings Collection, Guest Chefs, etc. Episodes of Everyday Food were also released on DVD. Unfortunatley, the venture proved to be less lucrative than the company had hoped and the DVD partnership expired. To date, these are the only DVDs of Martha's programs that have been made available for purchase. I have just left a message for martha to please reconsider and make more DVDs.I also bought my DVDs at tuesday morning stores for a discounted price.I have about 24 VHS tapes that i recorded back in i dont know maybe 2003 of her show . But i have missed the last few years,since direct tv quit airing her.Pity. To Anonymous, I would absolutely love to get copies of your vhs tapes or buy them from you. I miss that show so much. I too miss "Martha Stewart Living", the first TV show. Appropriate description: 'instructional, serious but calm'...so true. Watching her show for me was like going into another world. Believe it or not I had a cat that would sit or lay on the coffee table & watch the show. There we were: me, Mom & Alex, all eyes & ears on the TV. Guessing Martha's voice would calm her, she was a smart cat with a temper, one of my favorites, my baby, had to keep an eye on her as she would sneak up on you.